Do you really know all about the everyday spices in your kitchen cupboard? 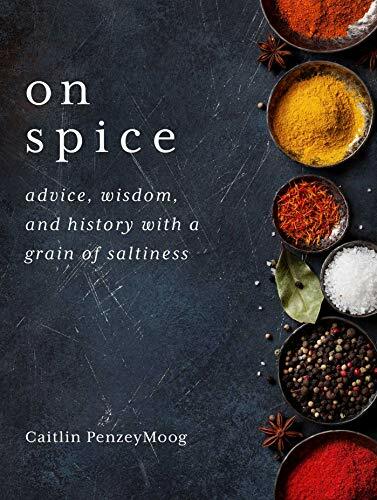 The answer will be a resounding no after you read Caitlin Penzey Moog’s latest book On Spice: advice, wisdom, and history with a grain of saltiness. Moog, part of the famous Penzey spice family, is the true mistress of spices and perfect person to write this delightful and interesting spice-filled saga. She grew up learning and working with spices at her grandparents’ small store in a suburb of Milwaukee, Wisconsin. In an unpretentious warehouse, she sniffed and savored the smells of cinnamon, saffron, and vanilla and all things spicy, sweet, and savory. If you were to cut open Moog’s veins, you’d probably find it full of fragrant cardamom, pungent cumin, and savory mustard. Her love of spice, their history and allure, makes for a pleasurable read. The footnotes are as interesting as the text and is filled with some tantalizing recipes (like the one for bathtub gin. You don’t need a bathtub to make it). Her spice heritage gives Moog a strong background and even stronger credential to write about their uses. Moog’s warm and earnest style of writing is like sipping on a comforting spicy drink, very much like a Smoking Bishop or Spiced Earl Grey Tea. So keep this broad definition of spice in mind while reading her book. Moog loves to work with all kinds of powders, barks, seeds, nuts, pods, flowers, stamens, and minerals, and the book reflects her interest. From the humble salt (turns out it is not so humble) to the exotic saffron, Moog writes with humor and precision. There is so much history, sometimes bloody and violent, entwined with the origin of spices. The Saffron Wars, a prolonged conflict between corrupt nobility and people whose saffron they stole, makes for a fascinating tale and read. There is nothing bland about vanilla and Moog shares the history of this sweet spice. In fact, vanilla bean’s reproductive system makes for an R-rated reading, and you’ll conclude that vanilla is just too exciting for some people. The book is filled with spicy tidbits. Did you know chewing on three juniper berries before drinking can stop you from getting a hangover? Connecticut is the “Nutmeg State” not because the spice is grown here but because Yankee peddlers carved “nutmegs” out of local wood and sold them as the real thing. The real thing, of course, cost a whole lot more. Besides spices, Moog has two sections to dedicated seeds such as fennel, aniseed, star anise, caraway, coriander, mustard, cumin, poppy, and sesame. The history, lore, and recipes for each of these seeds are explored fully in these sections. For cooks interested in blending spices into their own blends, Moog has you covered. From Adobo (a blend of paprika, oregano, salt, and garlic) to Vadouvan (a French take on curry blend containing cumin, fenugreek, garlic, mustard seeds, and onion) there is an impressive list of blends to suit many different styles of cooking. And then there are the recipes which use a variety of the spices, herbs, barks, and pods (to name but a few) that Moog loves. From Rhubarb Pie to Aloo Gobi and Saffron Shortbread Squares, there is a wide array of recipes featuring spice, of course!